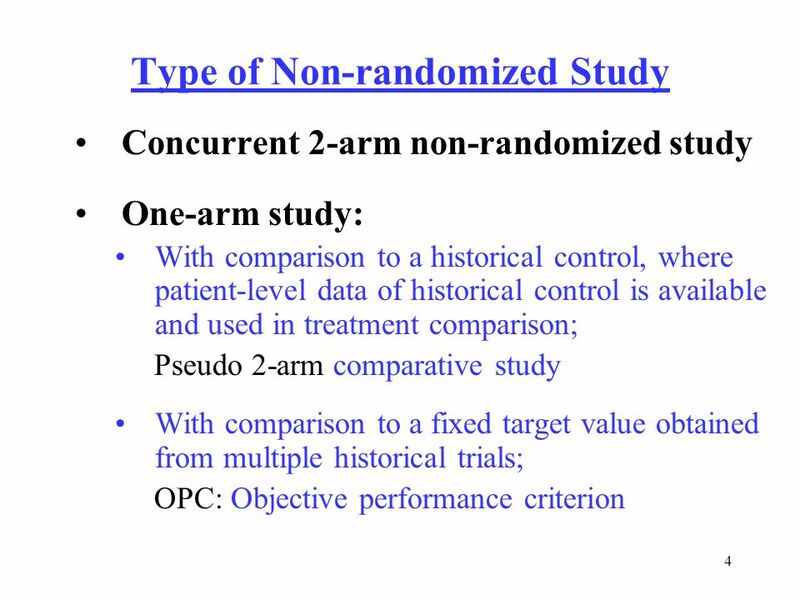 Non-randomized Medical Device Clinical Studies: A Regulatory Perspective Sep. 16, 2005 Lilly Yue, Ph.D.* CDRH, FDA, Rockville MD 20850 * No official support. 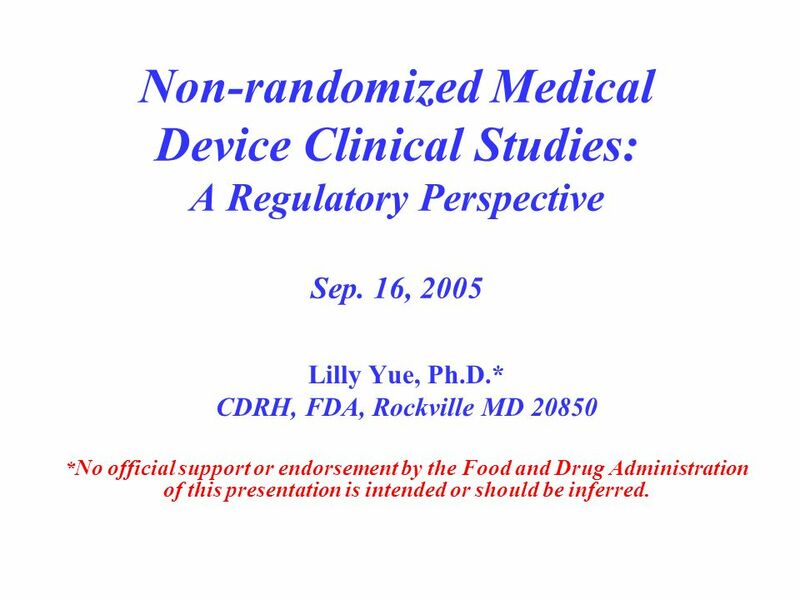 1 Non-randomized Medical Device Clinical Studies: A Regulatory Perspective Sep. 16, 2005 Lilly Yue, Ph.D.* CDRH, FDA, Rockville MD 20850 * No official support or endorsement by the Food and Drug Administration of this presentation is intended or should be inferred. 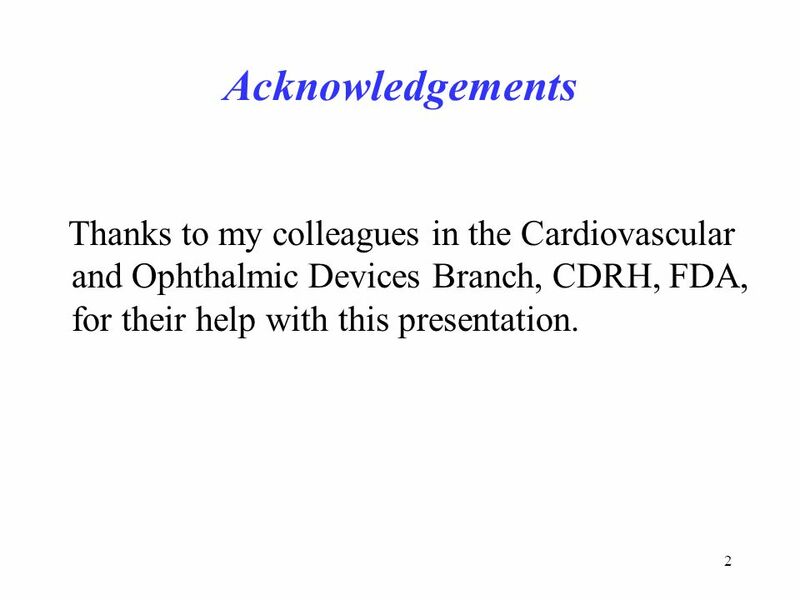 2 2 Acknowledgements Thanks to my colleagues in the Cardiovascular and Ophthalmic Devices Branch, CDRH, FDA, for their help with this presentation. 5 5 Why Non-Randomized? RCT is sometimes not ethical or practical. Sample size determination based on one- sample hypothesis test smaller sample size? May save time and money Least Burdensome? 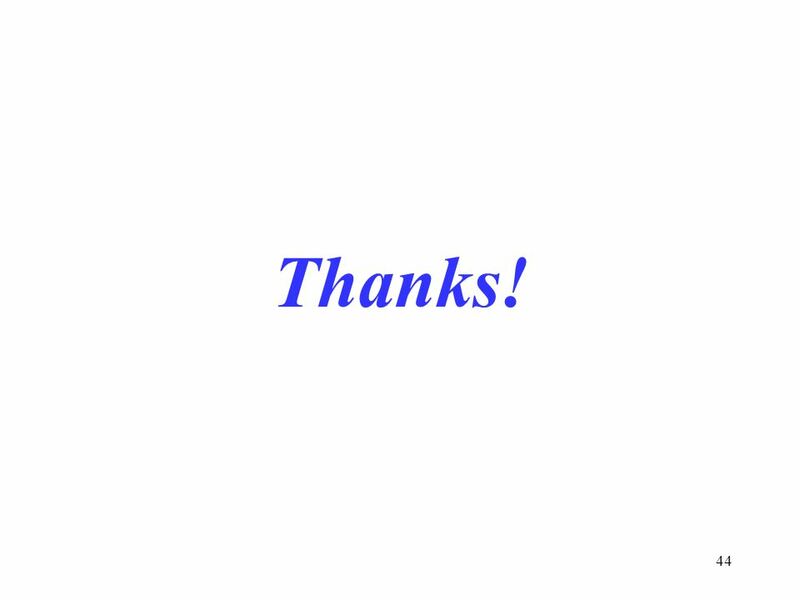 To keep the rapid pace of new technology development. 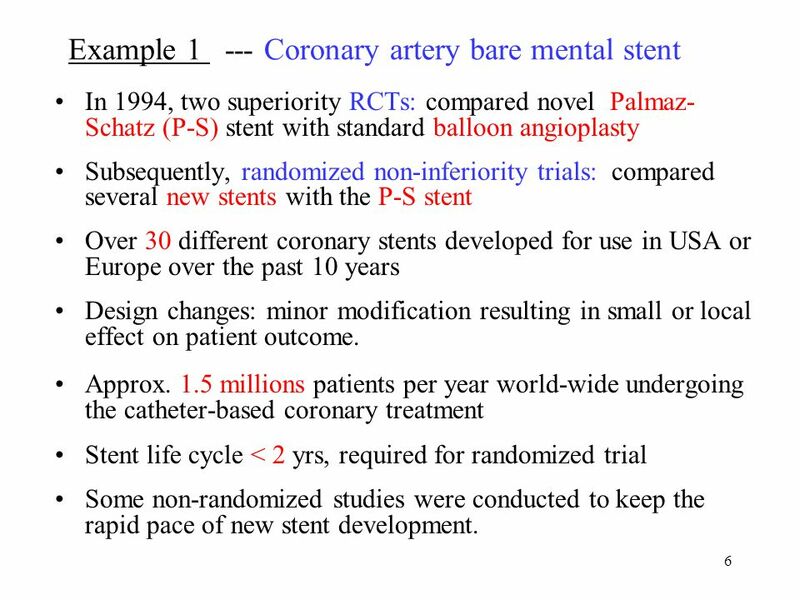 6 6 Example 1 --- Coronary artery bare mental stent In 1994, two superiority RCTs: compared novel Palmaz- Schatz (P-S) stent with standard balloon angioplasty Subsequently, randomized non-inferiority trials: compared several new stents with the P-S stent Over 30 different coronary stents developed for use in USA or Europe over the past 10 years Design changes: minor modification resulting in small or local effect on patient outcome. Approx. 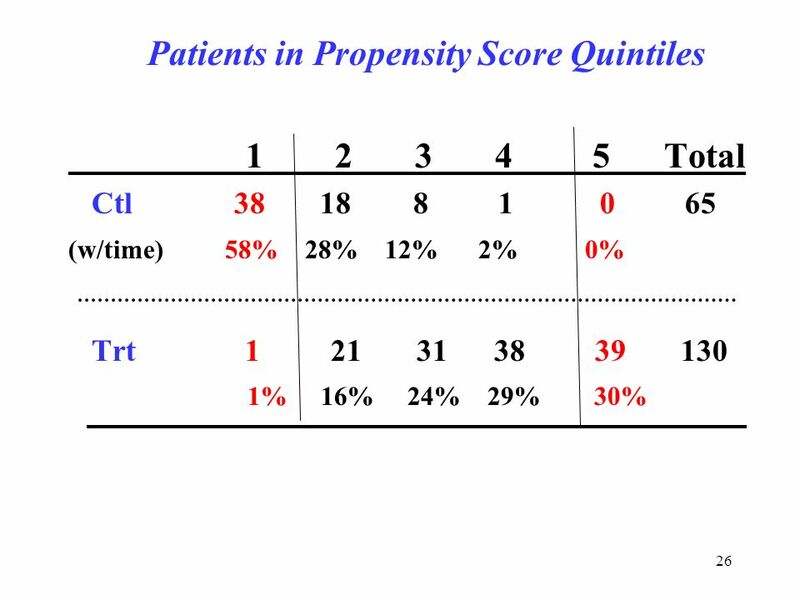 1.5 millions patients per year world-wide undergoing the catheter-based coronary treatment Stent life cycle < 2 yrs, required for randomized trial Some non-randomized studies were conducted to keep the rapid pace of new stent development. 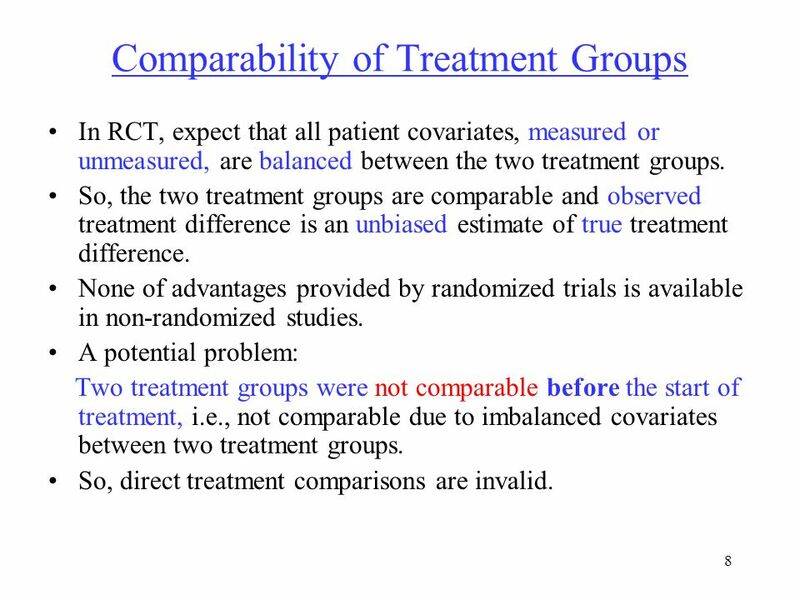 8 8 Comparability of Treatment Groups In RCT, expect that all patient covariates, measured or unmeasured, are balanced between the two treatment groups. 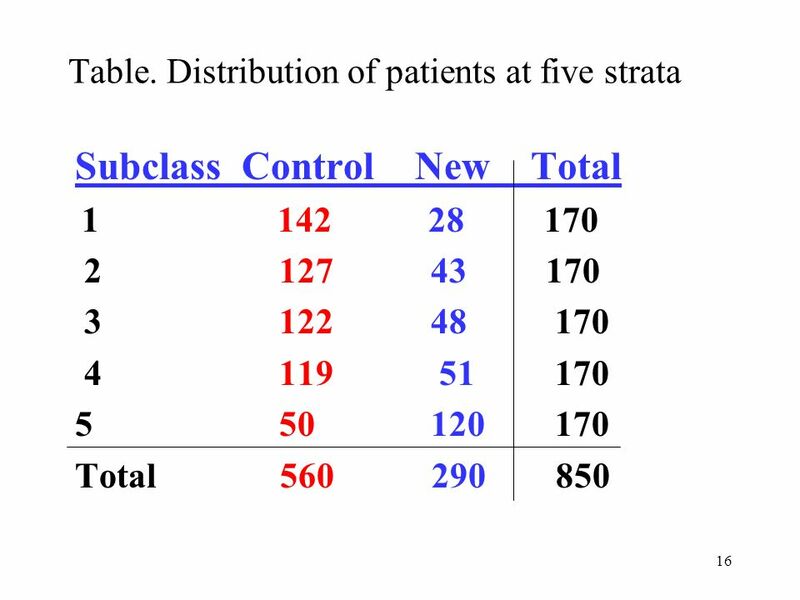 So, the two treatment groups are comparable and observed treatment difference is an unbiased estimate of true treatment difference. 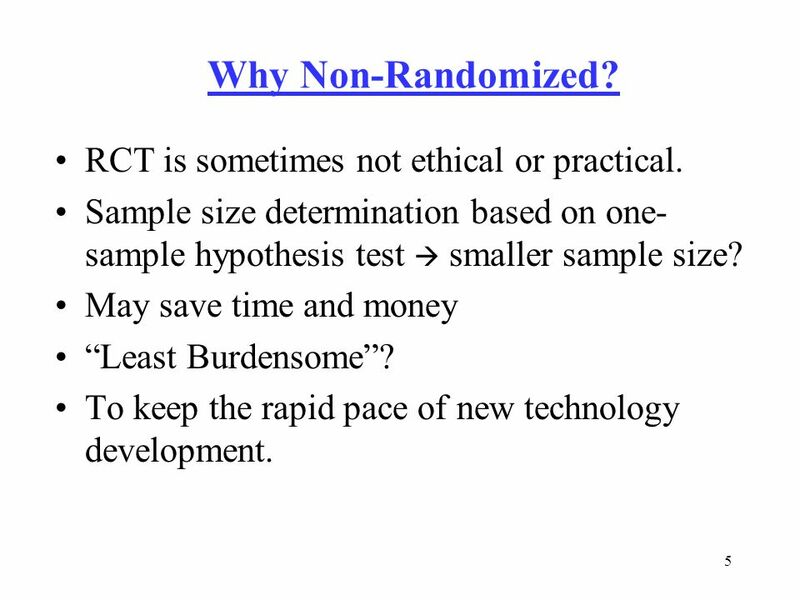 None of advantages provided by randomized trials is available in non-randomized studies. 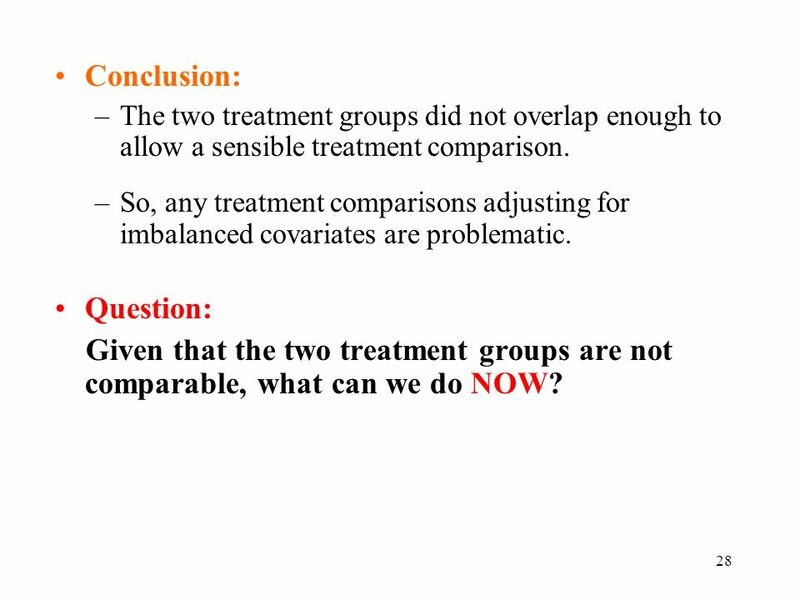 A potential problem: Two treatment groups were not comparable before the start of treatment, i.e., not comparable due to imbalanced covariates between two treatment groups. 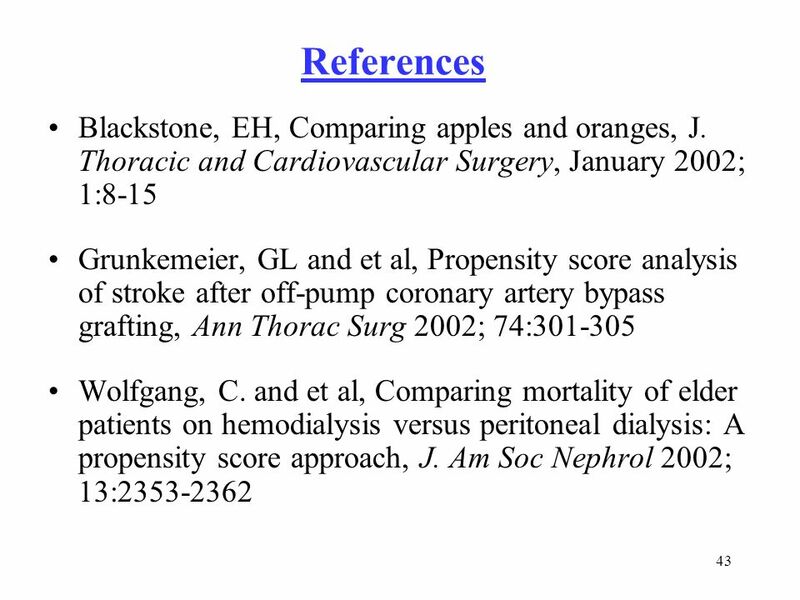 So, direct treatment comparisons are invalid. 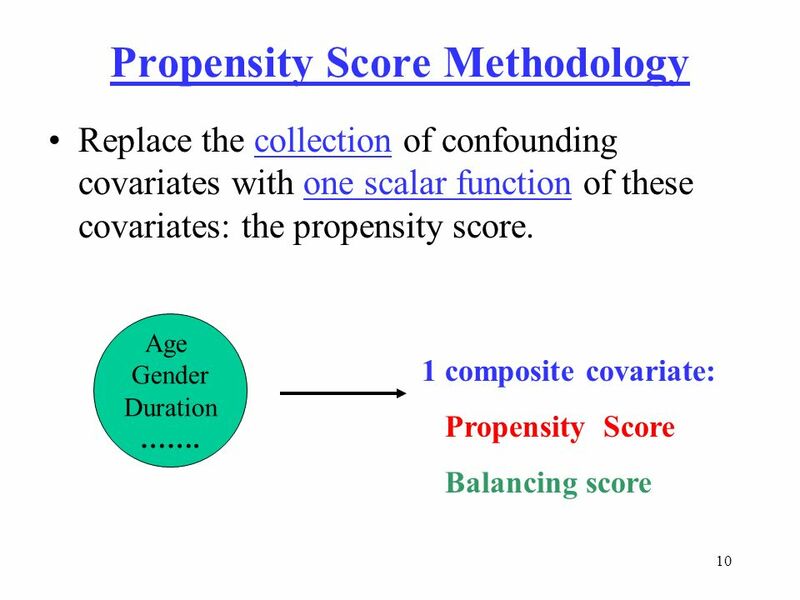 11 11 Propensity Score Methodology (cont.) 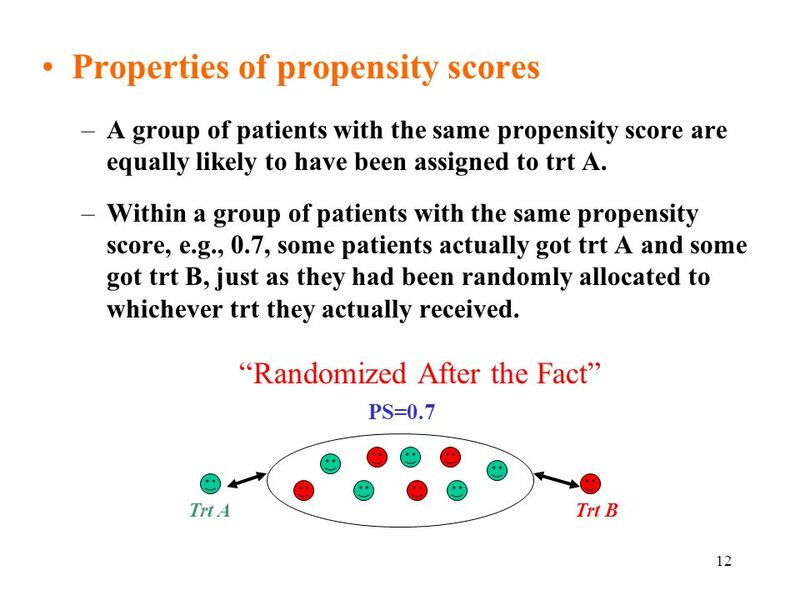 Propensity score (PS): conditional prob. 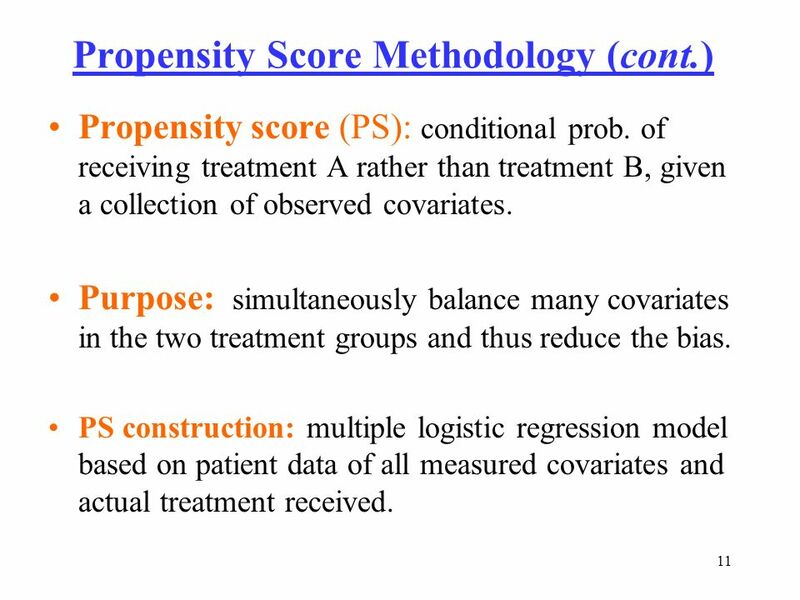 of receiving treatment A rather than treatment B, given a collection of observed covariates. 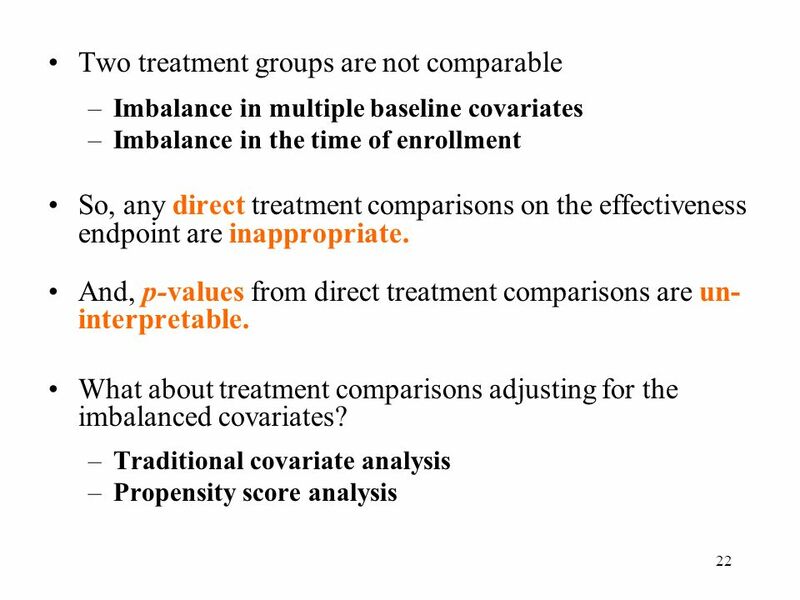 Purpose: simultaneously balance many covariates in the two treatment groups and thus reduce the bias. 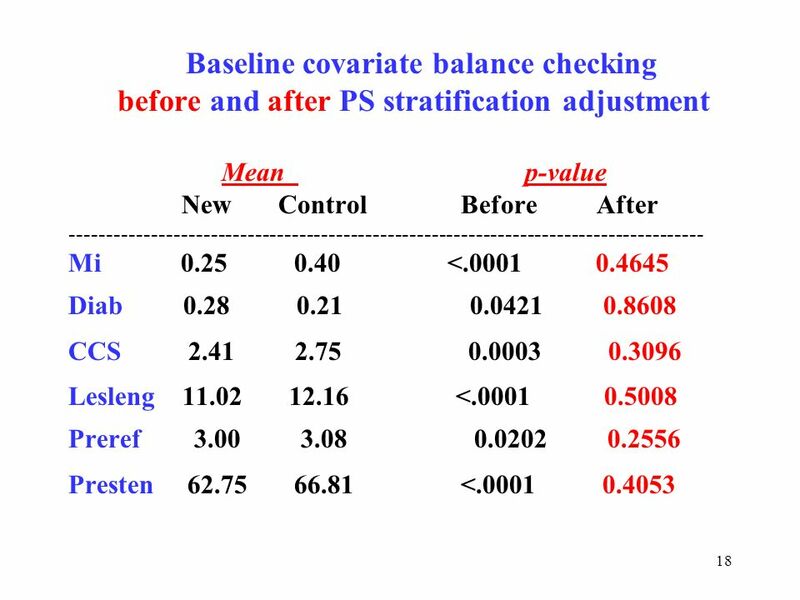 PS construction: multiple logistic regression model based on patient data of all measured covariates and actual treatment received. 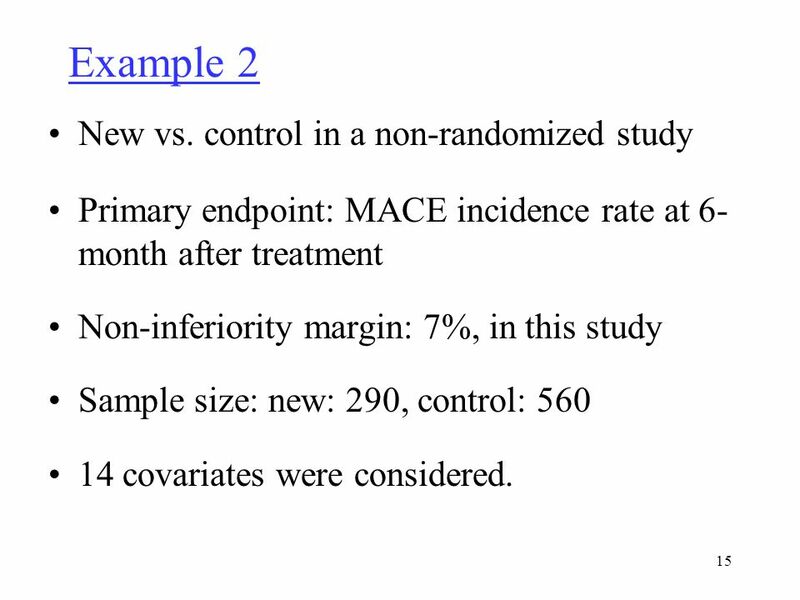 15 15 Example 2 New vs. control in a non-randomized study Primary endpoint: MACE incidence rate at 6- month after treatment Non-inferiority margin: 7%, in this study Sample size: new: 290, control: 560 14 covariates were considered. 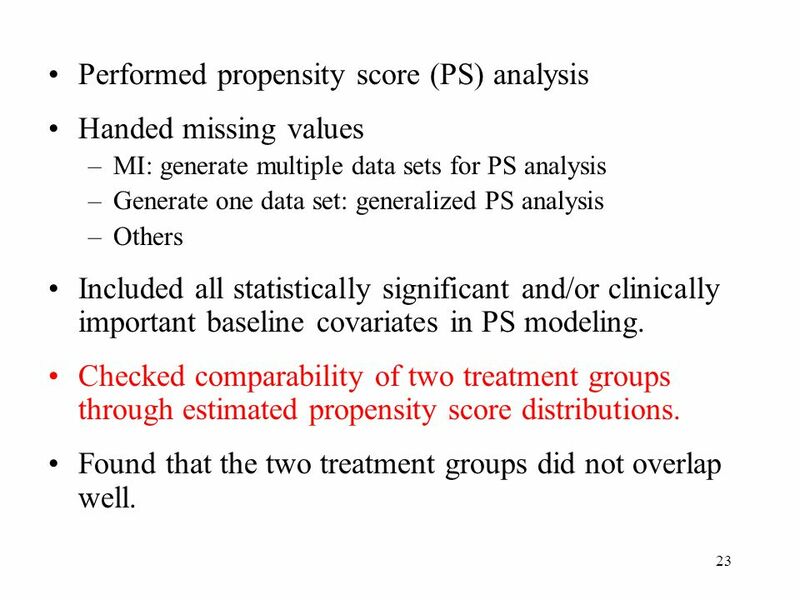 23 23 Performed propensity score (PS) analysis Handed missing values –MI: generate multiple data sets for PS analysis –Generate one data set: generalized PS analysis –Others Included all statistically significant and/or clinically important baseline covariates in PS modeling. 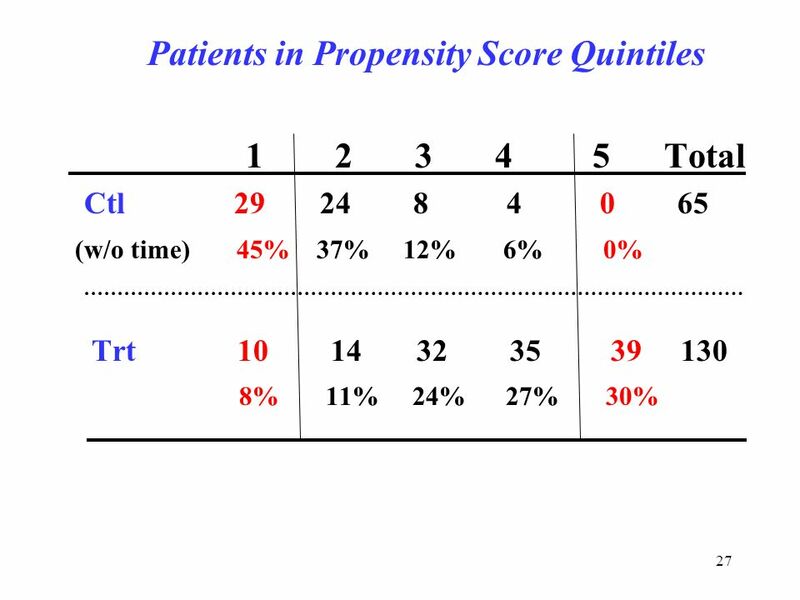 Checked comparability of two treatment groups through estimated propensity score distributions. Found that the two treatment groups did not overlap well. 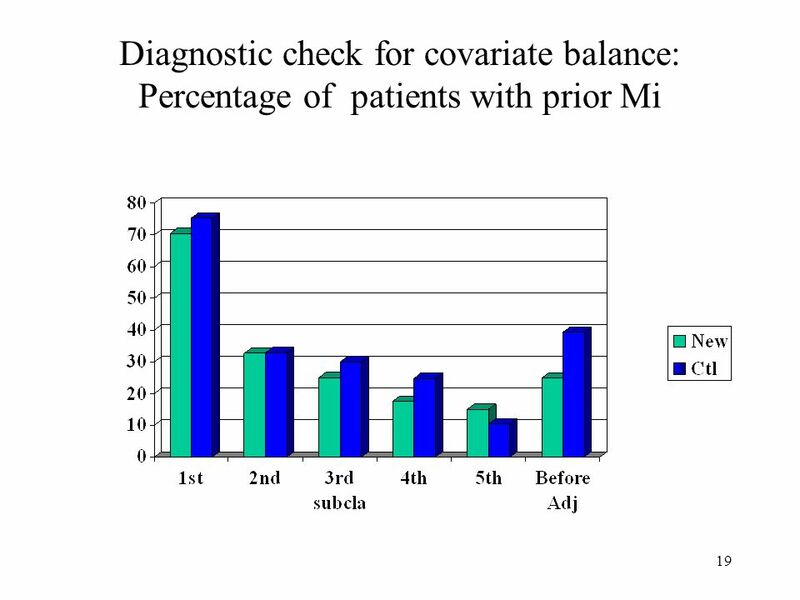 28 28 Conclusion: –The two treatment groups did not overlap enough to allow a sensible treatment comparison. 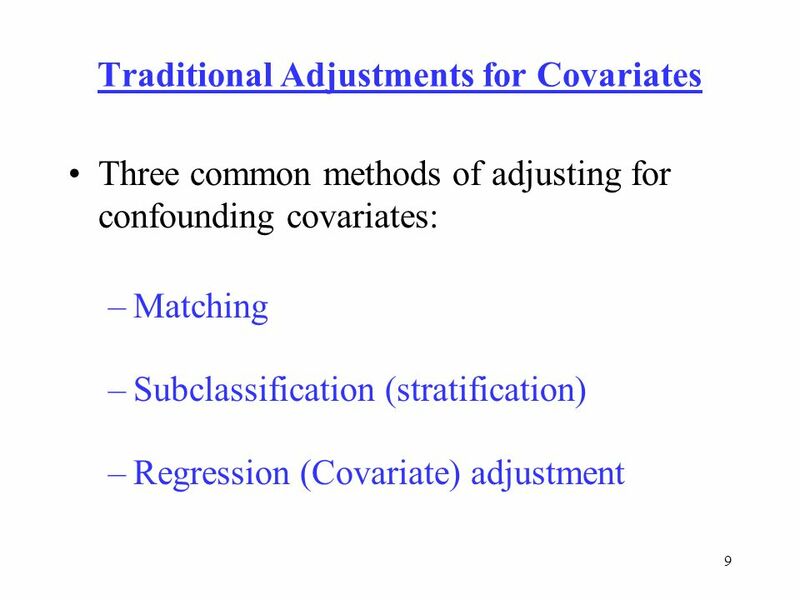 –So, any treatment comparisons adjusting for imbalanced covariates are problematic. Question: Given that the two treatment groups are not comparable, what can we do NOW? 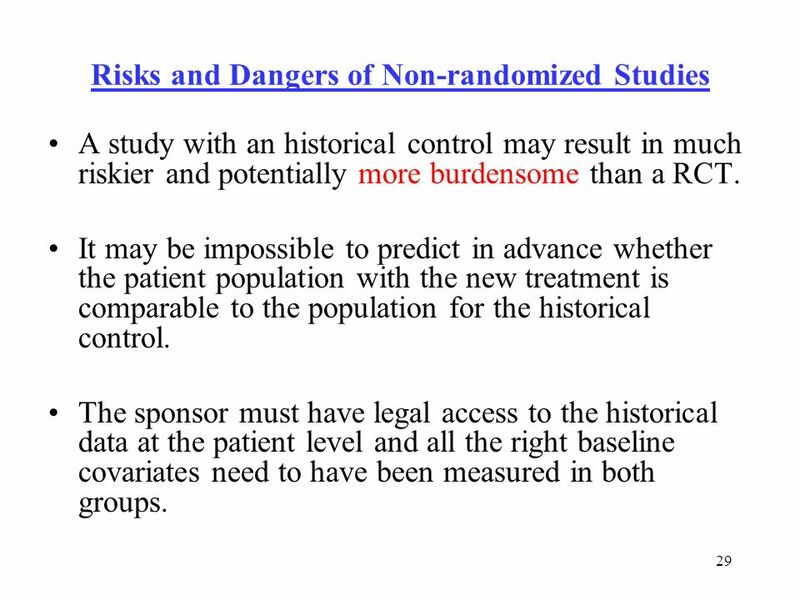 29 29 Risks and Dangers of Non-randomized Studies A study with an historical control may result in much riskier and potentially more burdensome than a RCT. It may be impossible to predict in advance whether the patient population with the new treatment is comparable to the population for the historical control. 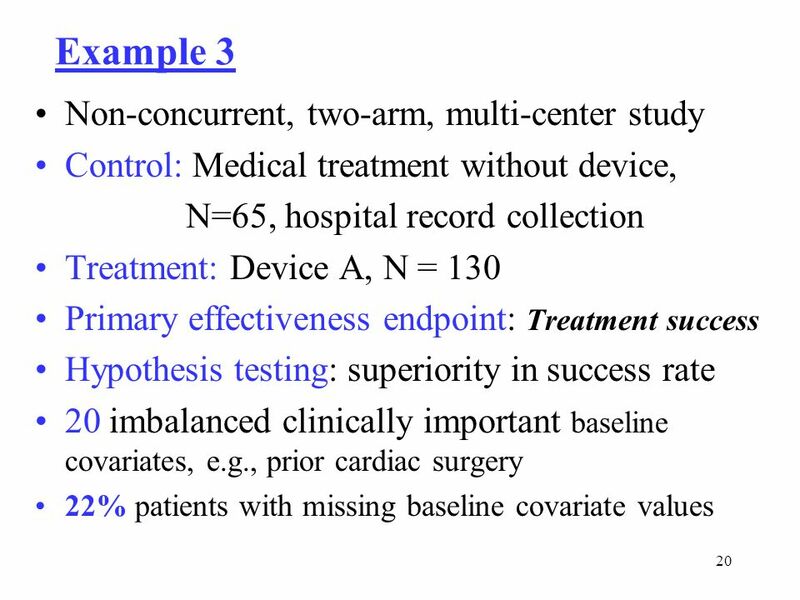 The sponsor must have legal access to the historical data at the patient level and all the right baseline covariates need to have been measured in both groups. 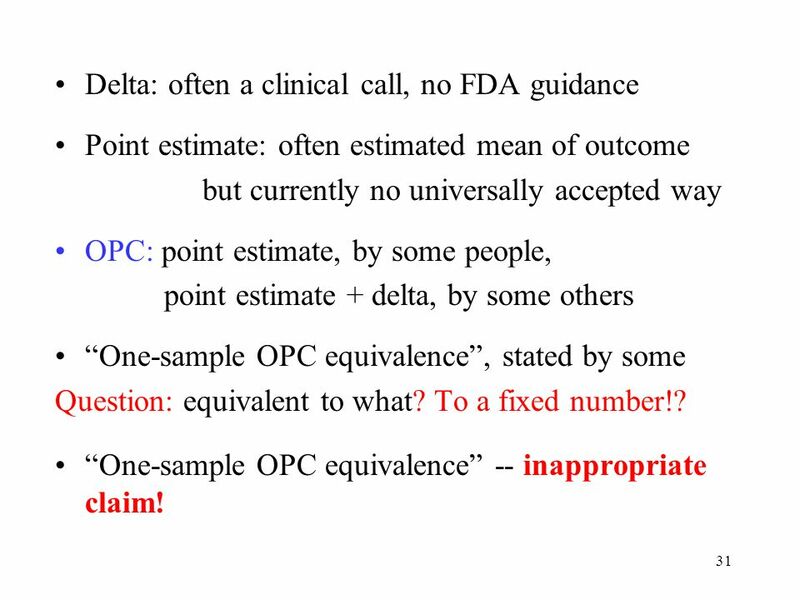 31 31 Delta: often a clinical call, no FDA guidance Point estimate: often estimated mean of outcome but currently no universally accepted way OPC: point estimate, by some people, point estimate + delta, by some others One-sample OPC equivalence, stated by some Question: equivalent to what? To a fixed number!? One-sample OPC equivalence -- inappropriate claim! 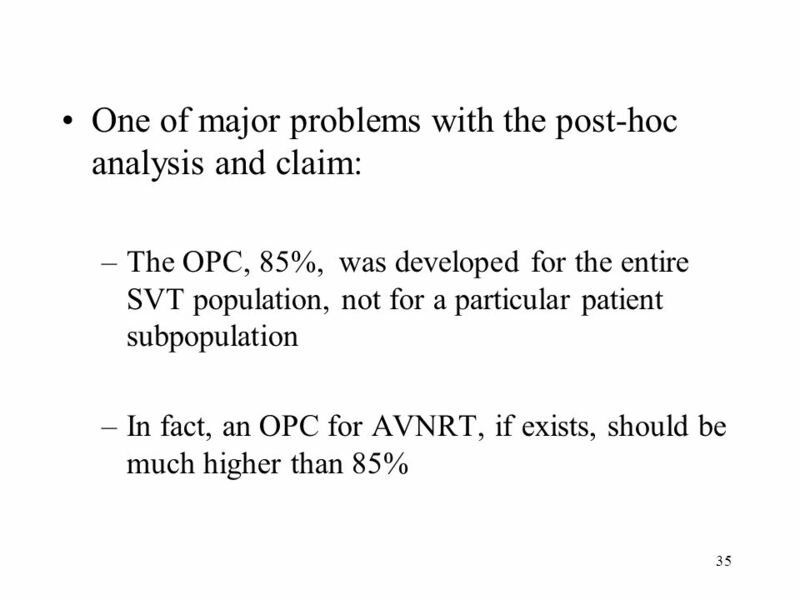 32 32 Problems with OPC: Limited good historical data available for the development of OPC Disregarded variability associated with the estimate in historical studies Bio-creep problem Time sensitive Patient population sensitive Who is responsible for developing the OPC for a particular device? Who is responsible for checking if the OPC developed is appropriate? Who is responsible for updating an existing OPC? 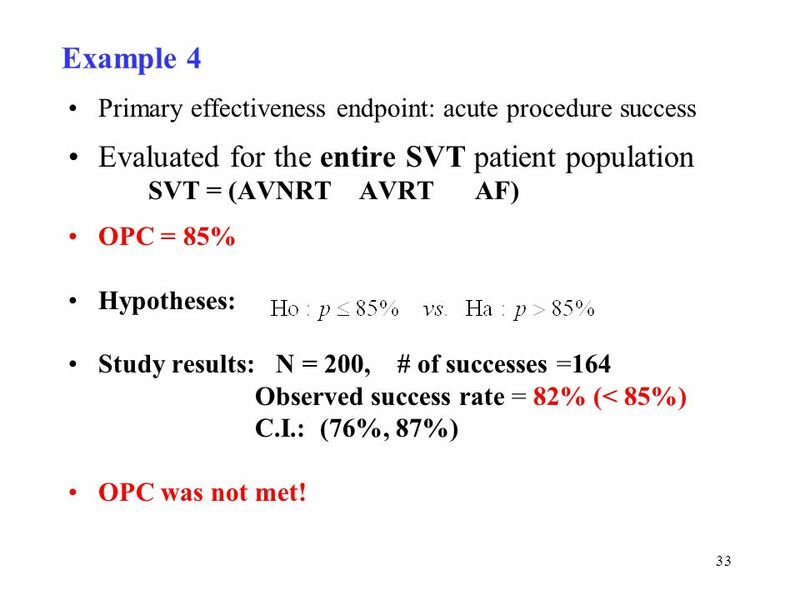 33 33 Example 4 Primary effectiveness endpoint: acute procedure success Evaluated for the entire SVT patient population SVT = (AVNRT AVRT AF) OPC = 85% Hypotheses: Study results: N = 200, # of successes =164 Observed success rate = 82% (< 85%) C.I. 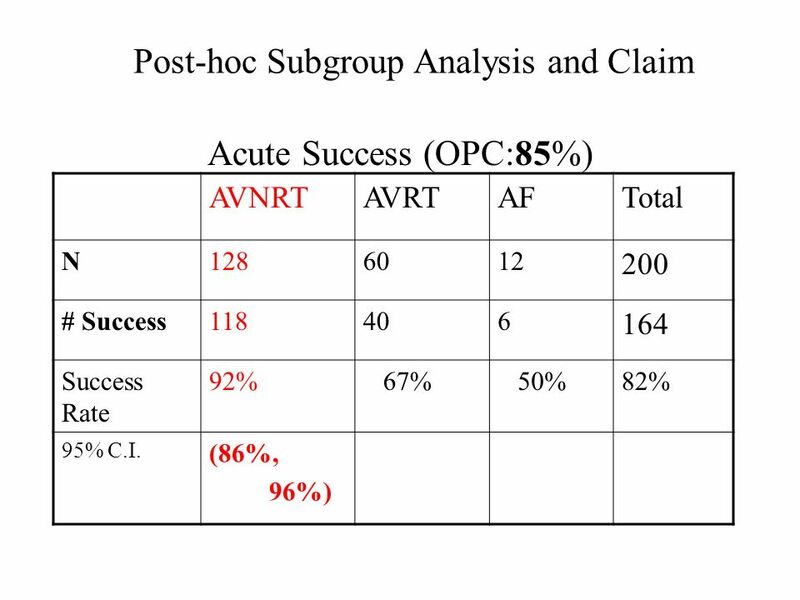 : (76%, 87%) OPC was not met! 37 37 Problems: N = n 1 + n 2 was fixed in protocol, but n 1 and n 2 and hence w 1 and w 2 were not. 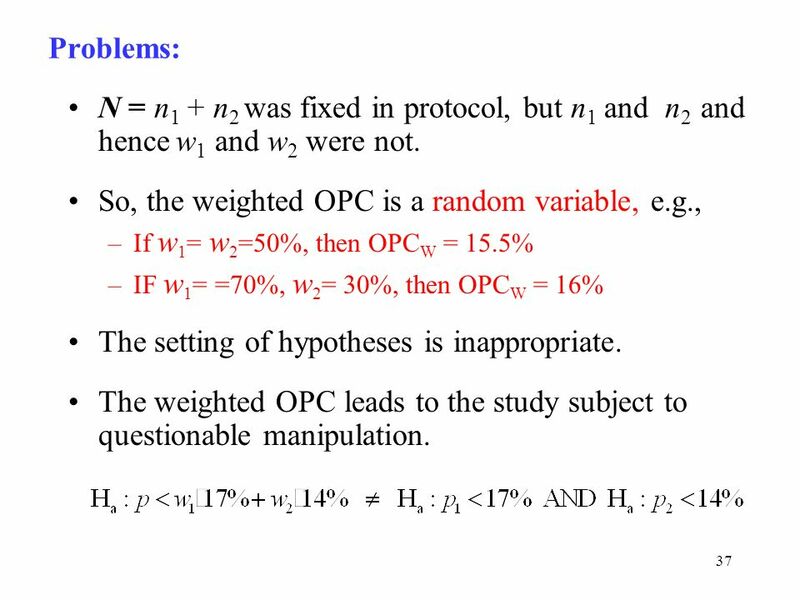 So, the weighted OPC is a random variable, e.g., –If w 1 = w 2 =50%, then OPC W = 15.5% –IF w 1 = =70%, w 2 = 30%, then OPC W = 16% The setting of hypotheses is inappropriate. 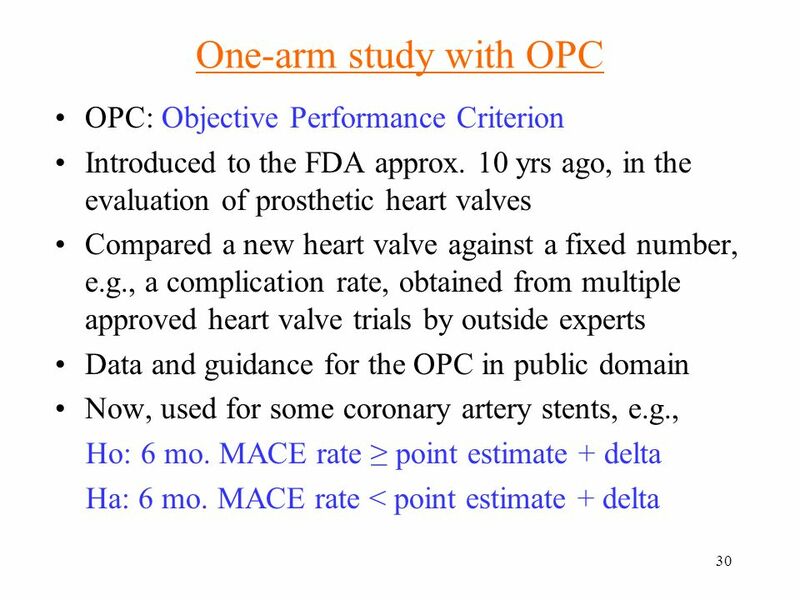 The weighted OPC leads to the study subject to questionable manipulation. 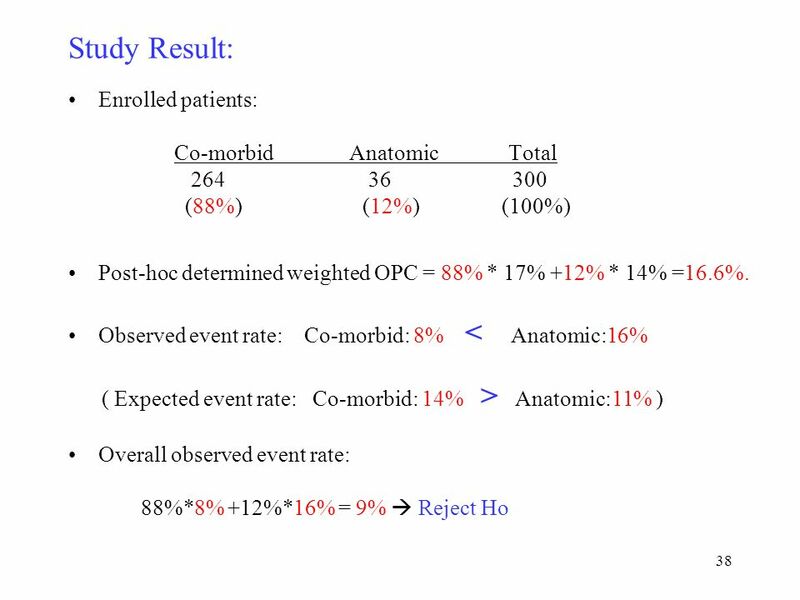 39 39 What if enrolled: Co-morbid: 12%, Anatomic: 88% Then, post-hoc determined weighted OPC = 12% *17% + 88% *14% =14.4% Overall observed event rate: 12% * 8% + 88% * 16% = 15% ( > 14.4%) Cant reject Ho! 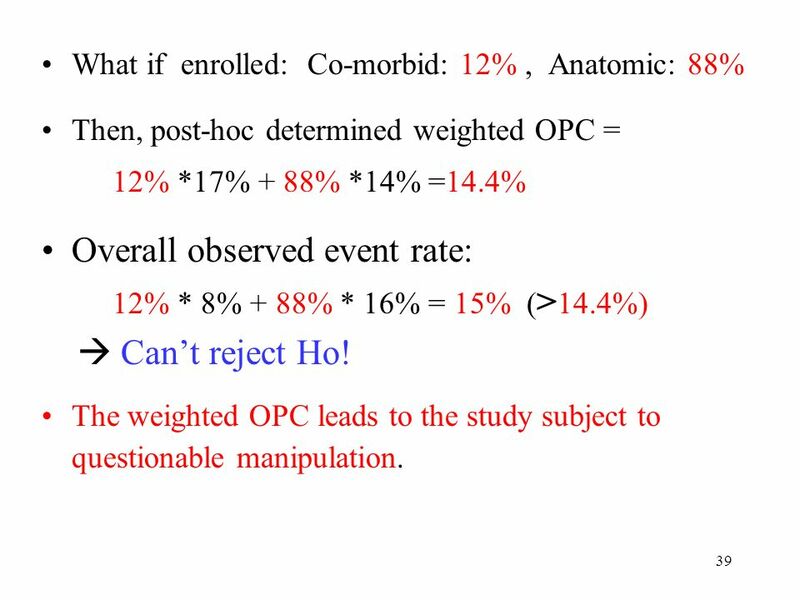 The weighted OPC leads to the study subject to questionable manipulation. 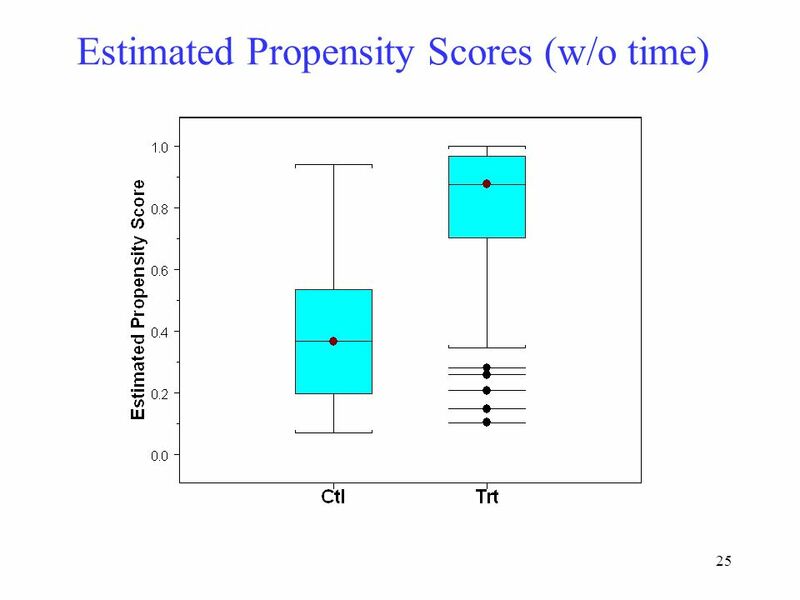 40 40 Test statistic: If treat n 1 and n 2 as fixed, then the calculated C.I. would be narrower than it should be. 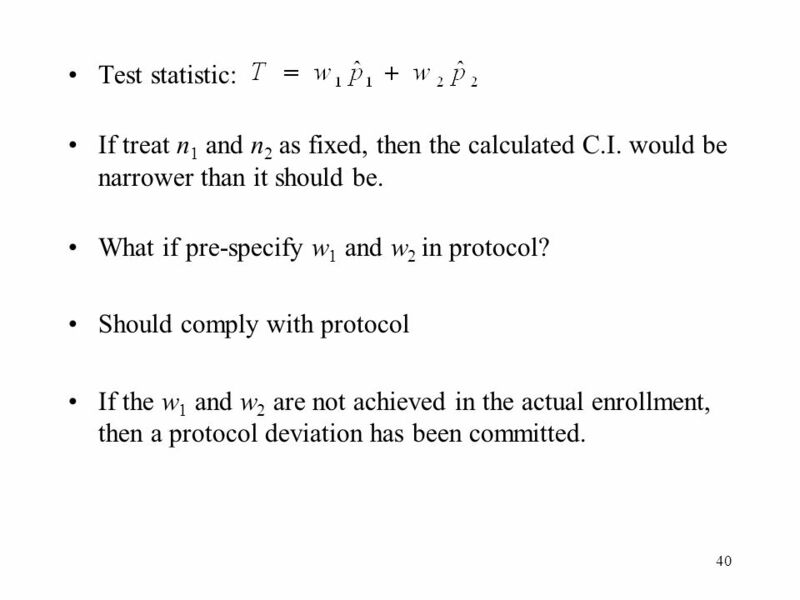 What if pre-specify w 1 and w 2 in protocol? Should comply with protocol If the w 1 and w 2 are not achieved in the actual enrollment, then a protocol deviation has been committed. 41 41 Conclusions Select comparable control prospectively! Bio-creep problem should be avoided. 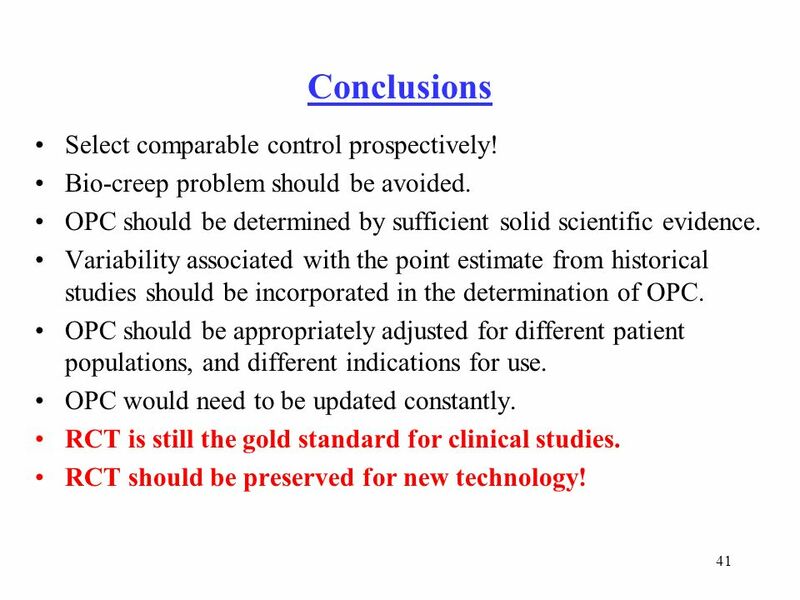 OPC should be determined by sufficient solid scientific evidence. 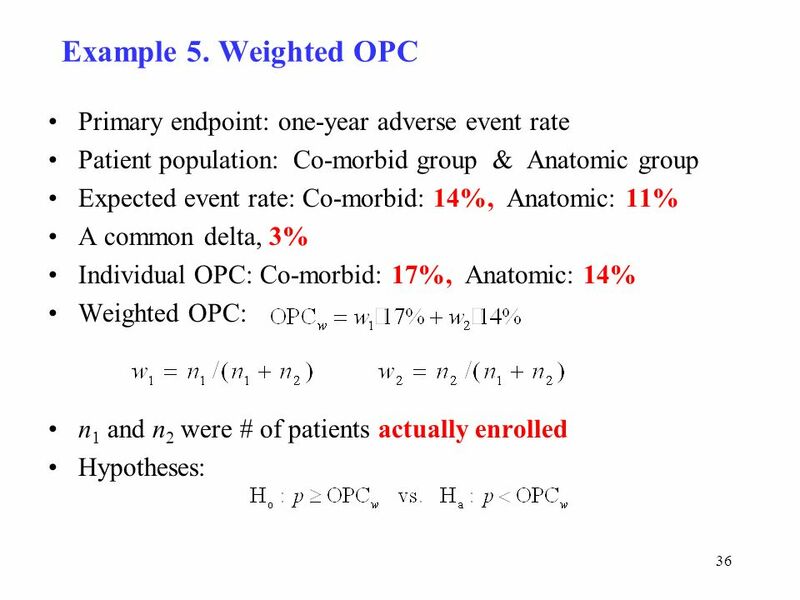 Variability associated with the point estimate from historical studies should be incorporated in the determination of OPC. OPC should be appropriately adjusted for different patient populations, and different indications for use. OPC would need to be updated constantly. 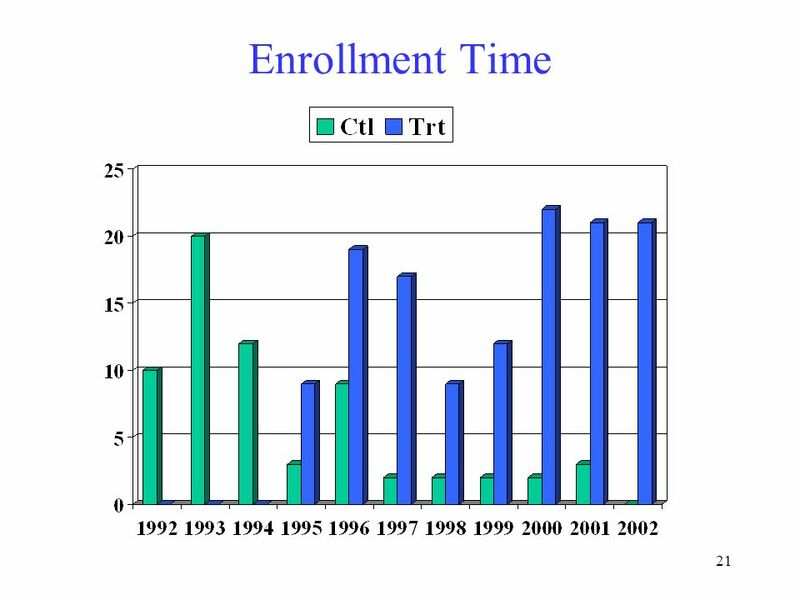 RCT is still the gold standard for clinical studies. RCT should be preserved for new technology! 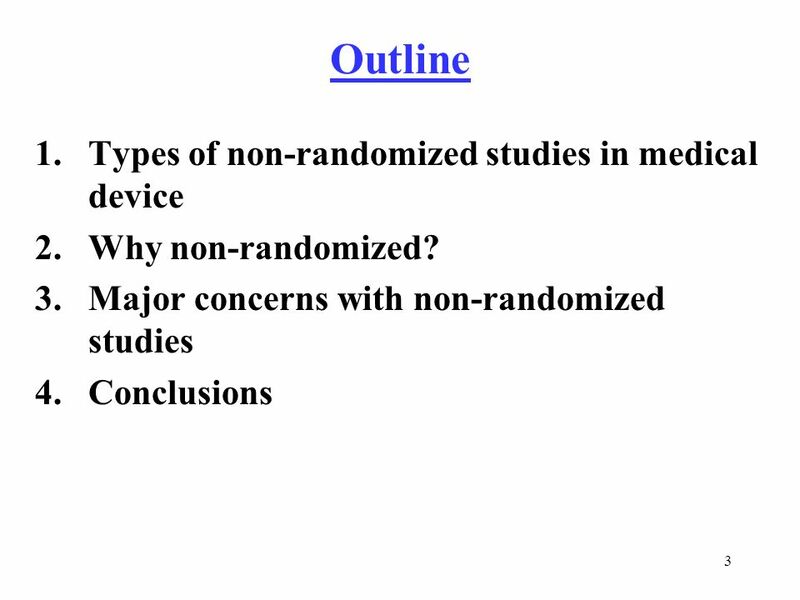 Download ppt "Non-randomized Medical Device Clinical Studies: A Regulatory Perspective Sep. 16, 2005 Lilly Yue, Ph.D.* CDRH, FDA, Rockville MD 20850 * No official support." 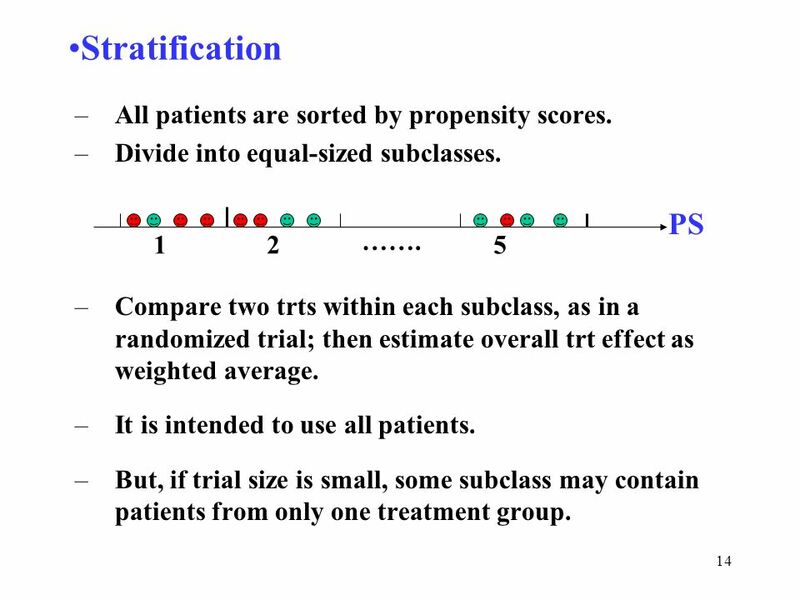 Interim Analysis in Clinical Trials: A Bayesian Approach in the Regulatory Setting Telba Z. 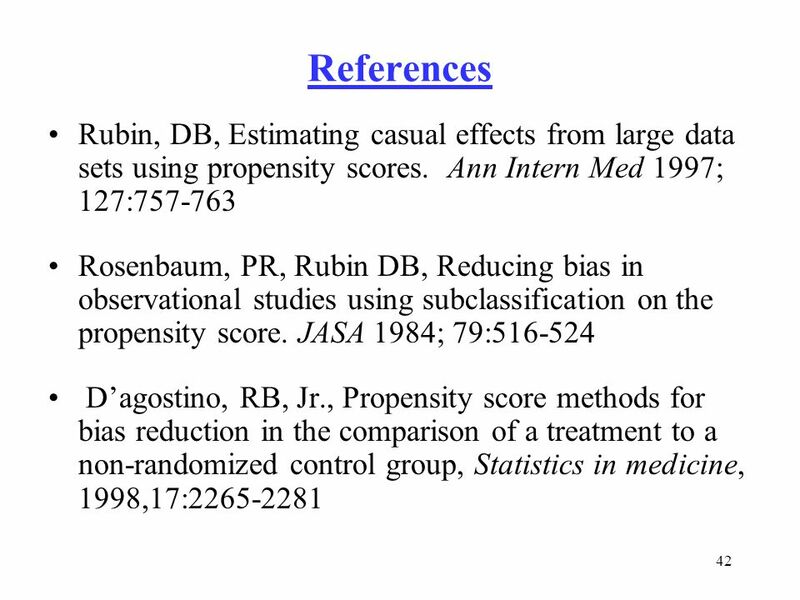 Irony, Ph.D. and Gene Pennello, Ph.D. Division of Biostatistics. 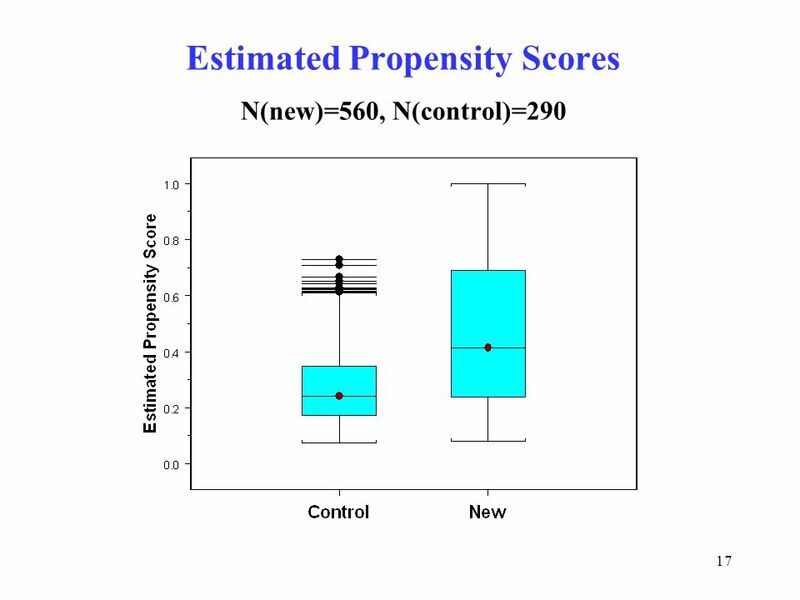 1 Superior Safety in Noninferiority Trials David R. Bristol To appear in Biometrical Journal, 2005. 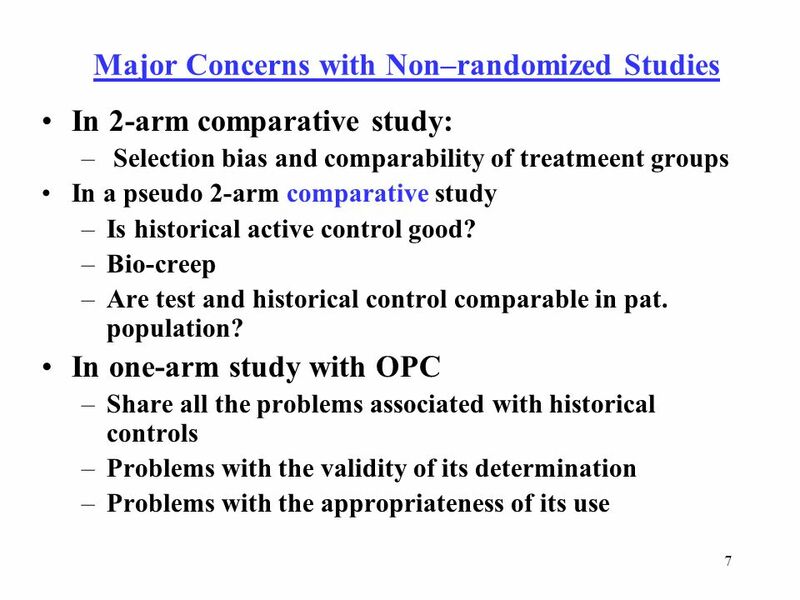 THE USE OF HISTORICAL CONTROLS IN DEVICE STUDIES Vic Hasselblad Duke Clinical Research Institute. 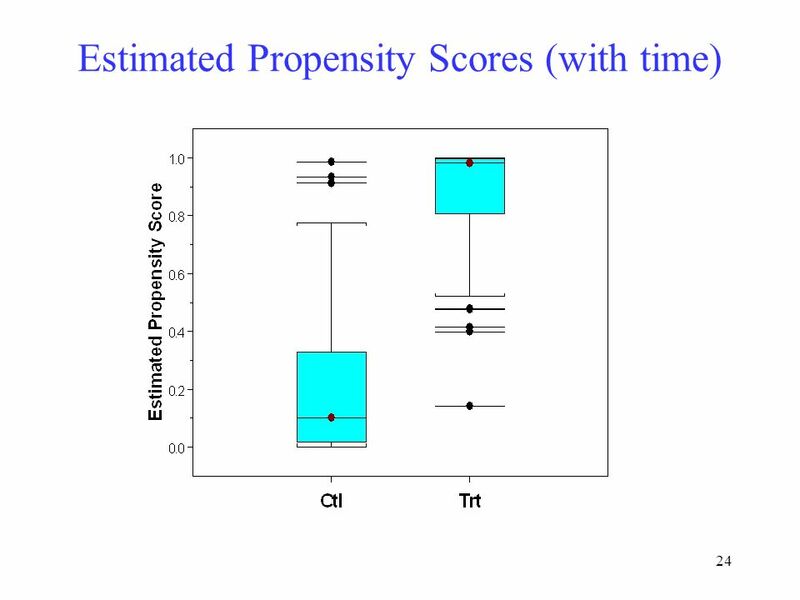 1 Propensity Scores Methodology for Receiver Operating Characteristic (ROC) Analysis. Marina Kondratovich, Ph.D. U.S. Food and Drug Administration, Center. 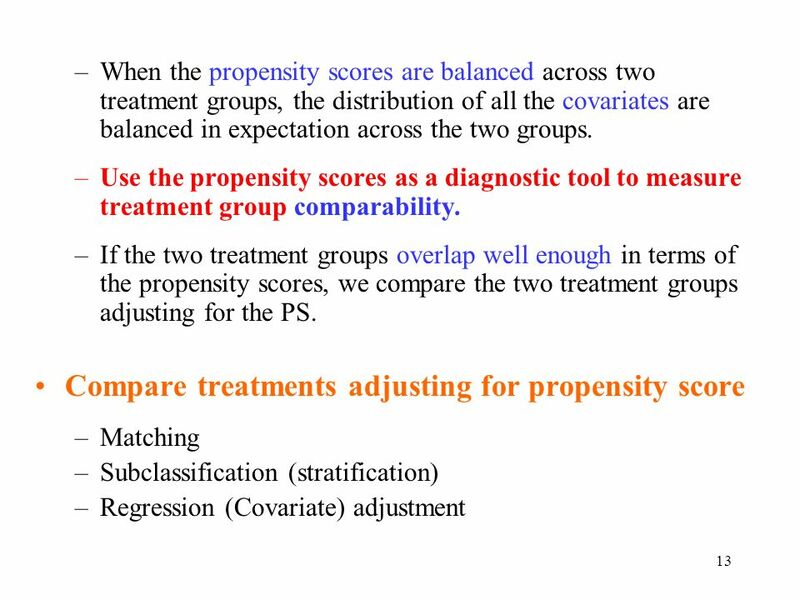 June 25, 2006 Propensity Score Adjustment in Survival Models Carolyn Rutter Group Health Cooperative AcademyHealth, Seattle WA. 1 TennCare Diabetes Program Evaluation Presentation to AcademyHealth Kenton Johnston, MPH, MS, MA June 4, 2007 An Individually-Matched Control Group Evaluation. Outline of talk The ONS surveys Why should we weight?